Home furnishings and kitchenware retailer Williams-Sonoma has sued Amazon over allegations that it wrongly holds itself out as an authorized retailer of Williams-Sonoma products. In a complaint filed this week in the Northern District of California, Williams-Sonoma alleges that Amazon created an unauthorized store on its site, and uses “misleading” search ads and email promotions -- to wrongly suggest it's an authorized Williams-Sonoma retailer. People who have purchased a product are usually allowed to re-sell it on Amazon (or other platforms). But Williams-Sonoma -- which sells merchandise under its name as well as Pottery Barn, West Elm and other brands -- alleges that Amazon misleads customers into believing that there's an official relationship between Amazon and Williams-Sonoma. Williams-Sonoma says this confusion harms it in several ways, including that some of the products offered on Amazon can be more expensive than those available from Williams-Sonoma. The complaint sets out a host of trademark infringement allegations, including that Amazon displays the name “Williams-Sonoma” in a misleading way. The company says that Amazon's pages for “purported Williams-Sonoma products” includes a hyperlink that takes customers to a landing page with the phrase “Shop Williams-Sonoma” at the top. That design and phrase indicates the Amazon shop is connected to Williams-Sonoma, the company alleges. Williams-Sonoma alleges that Amazon's search ads and email promotions confuse consumers. 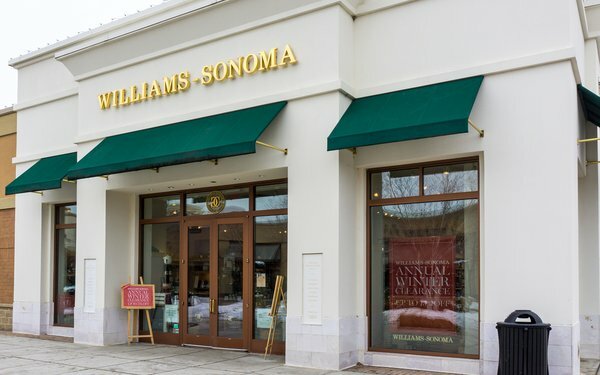 One Google search for the phrase “williams sonoma” returned with a headline that included the phrases “Williams & Sonoma at Amazon” and “Amazon Official Site,” according to the complaint. That ad “is misleading to ordinary consumers who are likely to believe that they were purchasing goods from an 'official' online retail source,” the complaint says. Williams-Sonoma also alleges that its president, Janet Hayes, received an email from Amazon last month that advertised Williams-Sonoma Peppermint Bark to her -- at a higher price than Williams-Sonoma sets. The email offered a one-pound tin for $47.35, when the store sells the same product online for just $28.95, according to the complaint. Williams-Sonoma alleges separately that Amazon's private label, “Rivet,” sells knockoffs of the furniture Williams-Sonoma sells under the “West Elm” brand. “Amazon’s Rivet brand markets and sells an assortment of products which are strikingly similar to West Elm’s,” the lawsuit alleges.